Originally released in 1993, id Software's first-person shooter Doom is one of the most famously violent videogames of all time. But for some people, it's not violent enough. 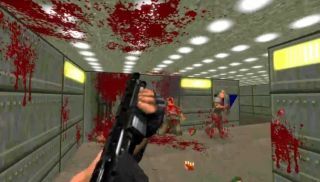 That's where the Brutal Doom mod comes into play: It's Doom, with dramatically upgraded weapons, audio, blood, and guts. And eyeballs. And teeth. And limbs. And... well, you get the idea. The core Doom gameplay remains essentially the same—kill everything that moves—but it's been sped up and enhanced with things like a flamethrower, the ability to boot demons off ledges or rip them in half with your bare hands, copious amounts of blood on every imaginable surface, and dual-wielded weaponry. You can also dual-wield your middle fingers, for a quick and easy way to express frustration and annoyance with demonic infestations of Martian research stations. The Brutal Doom mod is free, but requires a copy of Doom, Doom 2, or some functional variation thereof. Full installation instructions are available here; download the Brutal Doom v20 mod from ModDB.